Ashara Wills is a young woman with a life-long dream, a dream that until recently appeared outside her reach. Purely based on her gender, she was up against it. That was until the women’s football revolution. A passionate fan of Australian football – and particularly the West Coast Eagles – she has played in the state-based women’s football league, but she wants to take her involvement to another level. She has an insatiable appetite for the game and is keen to absorb as much knowledge as she can. Wills ultimately wants to impart that knowledge on to other girls and women keen to join the rapidly evolving female football movement. She wants to coach footy. 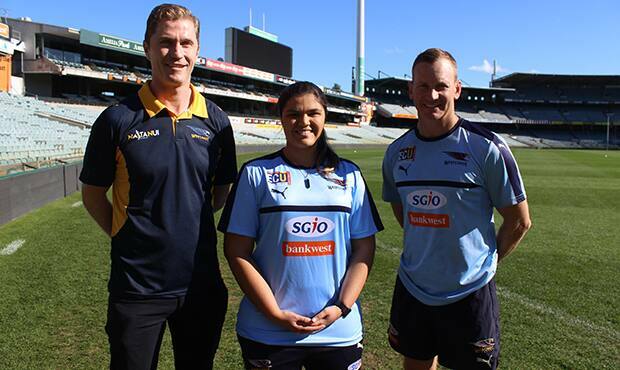 And an important step in that objective has been realised by earning a 10-week internship with the West Coast Eagles under the banner of an Alex Jesaulenko Scholarship, an AFL initiative aimed at providing opportunities for multicultural players and coaches to gain deeper insights into life at the elite level. It was open to both male and female enthusiasts, but Wills got the nod. She encountered 2006 premiership player Adam Selwood at several community events through his role with West Coast’s Next Generation Academy and he encouraged her to apply. “We were in contact regarding the Next Generation Academy and female academies via email and I just said to him I wanted to be involved in whatever capacity was possible,” she said. “For eight years I have been involved with Claremont (women’s football) playing and I started coaching in 2013. “I was in conversation with Adam and he said something had come across his desk and asked whether I would be interested in applying for it. Being multicultural myself, I went through the preliminary questions and then he said, “Come in, we’ll have a meeting as part of the application process”. “Before I knew it, I was having a meeting with Craig Vozzo (general manager of football), Gavin Bell (head of coaching development), Luke Dwyer (midfield development coach) and Adam. That was on the Friday - and then I got a phone call on the Monday evening to say I had the internship. “It is super, super exciting. This whole movement with female football has just been crazy. “When I was in primary school all I wanted to do was play footy. There were no avenues for me to play. At 15 or 16, I was working on an IGA checkout and a guy come through in a Canningvale Cougars polo and I asked if I could play football. “He came back the next week and said until I was 18 there was no way. When I did join, I was expected to know game sense, how to tackle, handball, kick; all the different skills to play, when all I had done was kick-to-kick at school. She became involved in coordinating junior clinics in the Claremont zone, gradually assumed more responsibility and developed her knowledge and understanding of the game. “I was slowly asked to do more things. I got my level one coaching accreditation and I have applied for my level two,” Wills said. “My interest is in coaching; the only reason I am still playing is because of the culture and my friends. From a background of a Malaysian mother and an English father, it was an uncle who first fed Ashara’s football appetite. When unable to play football, she reached State level basketball and soccer (where she was a goal-keeper because she liked to use her hands) and some of those skills aided her transition to football. “I’m trying to find my feet because it is the first time an intern has been at the club,” she said after her second day at the club. “I’m really looking forward to it. The coaches’ willingness to share and help me has been amazing. Being a female I thought I might come up against a bit of resistance, but they have been so helpful. “My goal is to coach at a much higher level, but any role that’s going at the moment I have an interest in; any opportunity that comes around for coaching development. Claremont has its coaching structure pretty well in place at the moment. The West Coast Eagles have made a strong pitch to gain entry into the AFLW when it expands beyond the current eight-team competition in 2019 and Wills is excited at that prospect. She would love to be part of it when it eventuates, but will be thrilled to see other Western Australian women living the dream should things not fall her way. “That would be great,” she enthused.